Disk Management under Computer Management in Administrator Tools is a GUI (Graphical User Interface) based disk partitioning utility that allows Windows 2000, Windows Server 2003, Windows XP, Windows Vista, Windows 7, Windows 8, Windows 8.1 and Windows 10 users to set active partition, change drive letter and paths, extend volume, shrink volume, delete volume, and format the drives. However, Disk Management extension in Microsoft Management Console (MMC) does not always work properly. Problems faced by users including random grayed out or disabled of Extend Volume and Shrink Volume options, as Disk Management snap-in prohibits you from inadvertently performing actions that may result in data loss. If you’re getting frustrated with Disk Management, try out DiskPart utility, a text-mode command line interpreter based on scripts to manage, create, delete and resize objects such as disks, partitions and volumes in Windows 10, Windows 8.1, Windows 8, Windows 7, Windows Vista, Windows XP, Windows Server 2003 and Windows 2000. (The last 3 operating systems listed earlier do not come with DiskPart.exe by default, so users need to download and install DiskPart manually). As DiskPart is a command line utility, users will have to use various commands to instruct DiskPart to perform a disk related task. Users can use HELP command to list out all available commands for DiskPart. For various options for a command, append the command name to HELP, i.e. HELP [command], or simply type the command name itself only. For detailed explanation and guide to use the command, append the full command syntax to the HELP, i.e. HELP [full command syntax with option]. For easy reference and getting start guide, here’s some simple operation that you can perform on your hard disk and partition or volume with DiskPart. But before you continue, make sure that you backup important files and programs in case of any failure. To run DiskPart, type DiskPart.exe in Start Search in Windows Vista, Windows 7, Windows 8, Windows 8.1 and Windows 10, or in Run command text box in Windows 2000, Windows Server 2003 and Windows XP finished off by Enter key. A command prompt window with DISKPART shell is loaded. To all your available installed hard disks on the system, simply type list disk, and hit Enter. 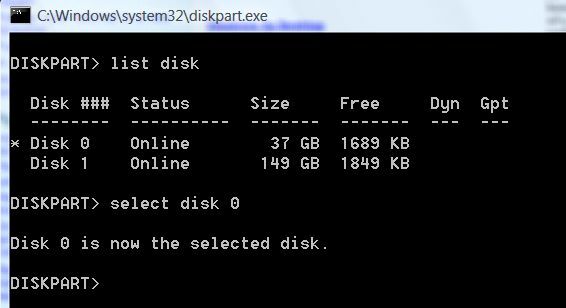 The disk number is retrieved from “list disk” command. The partition types that are supported are primary partition (the only bootable type, but limited to four per hard disk), extended partition (also limited to four per hard disk to supplement those need more than 4 primary partitions), logical drive (to define within extended partition to allow many volumes to be created), EFI system partition and MSR (Microsoft Reserved partition). Note that not all options are available for all partition type. The number for the volume is retrieved from “list volume” command. The number for the partiton is retrieved from “list partition” command. The above command works on when both volume or partition is selected. Note that system, boot or any volume/partition that contains the active paging file or crash dump (memory dump) cannot be deleted. And users must select a partition or volume before start deletion operation. Dynamic disks should be removed by using “delete volume” command. Simply select a partition or volume, and then type format.